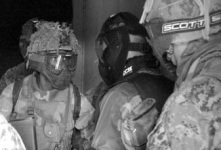 11-19 September [Companies] conducted SASO training at the Marine Palms Housing complex in 29 Palms, California, MCAS Miramar, and Segall Studios. MARINE CORPS BASE HAWAII, KANEOHE BAY, Hawaii — As preparation for a possible future deployment to Afghanistan, Marines from 3rd Battalion, 3rd Marine Regiment, traveled to Twentynine Palms, Calif., for a Combined Arms Training Exercise during the month of September. During their stay, the Marines from “America’s Battalion” will train using the integration of air and ground elements along with live-fire exercises. Although the Marines train numerous times every year with similar exercises at the Pohakuloa Training Area on the big island of Hawaii, Twentynine Palms will be more realistic as the weather there is similar to what they could potentially experience in the future, said Cpl. Carlos R. Johnson, operations non-commissioned officer for 3rd Marine Regiment. Upon finishing their training in Twentynine Palms, the Marines will move on to the Marine Corps Mountain Warfare Training Center, Bridgeport, Calif. This post is one of the most isolated in the Marine Corps and the training emphasizes the development of both individual and unit mountain skills with the primary emphasis on enhancing the overall combat capability of the unit. “It’s basically the same sort of training that we do when we go to PTA,” said Johnson. “The main thing for the Marines to get used to and be forced to deal with is the harsh weather conditions.” Once training wraps up, Marines will return to MCB Hawaii, Kaneohe Bay, sometime in early October and will await any future deployments. CAMP WILSON, TWENTYNINE PALMS, Calif. — As the fiery sun is making its descent over the desert expanses of Southern California, weary warriors trudge back to their hooches, exhausted from another day of some of the most serious training the Corps has to offer. The Marines may be tired, but they are bold and determined. From across the ranges of the Marine Corps’ infamously grueling Twentynine Palms Air Ground Combat Center, to a mock Middle Eastern village on a movie set in San Diego, the leathernecks of 3rd Battalion, 3rd Marine Regiment, “America’s Battalion,” are midway through a whirlwind pre-deployment package. Now moving on to the snow-covered hills of the Mountain Warfare Training Center in Bridgeport, Calif., this unique training program was designed to get them prepared, both mentally and physically for an upcoming contingency deployment. “The purpose of the training exercise is to build ‘strategic corporals,’ to put our Marines in the middle of the three block war and ensure they know how to properly tailor their force so as to protect themselves and their fellow Marines and destroy anti-coalition forces without alienating the local populace,” said 3/3 commanding officer, Lt. Col. Norm Cooling. 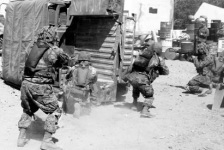 At the studio, America’s Battalion experienced a mock town complete with costumed “insurgents” and improvised explosive devices. At an alternate site aboard Marine Corps Air Station, Miramar, the Marines also conducted convoy ops and more Entry Control Point (ECP) and Vehicle Control Point (VCP) training. 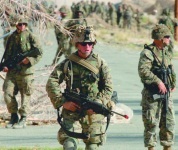 The Marines conducted these operations while receiving fire from Segall Studio’s professional actors and actresses – some of whom are former service members with combat experience. The realism of the village was astonishing for Marines during their patrol operations. “It was as close to the fight as I think could be simulated,” said Lance Cpl. Zach Zeid, tactical data network specialist, headquarters and service company, 3/3. “I had to guard a PUC [person under control] and I had everything we’d trained for running through my head, all of the rules of engagement and everything. I definitely had some adrenaline going through me,” added Zeid. While the companies were rotating through Segall studios and MCAS Miramar, others were involved in Small Wars training in the abandoned Marine Palms Housing Area aboard Twentynine Palms. 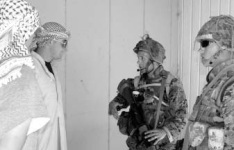 There they participated in cordoning and searching, and learned the fine details of vehicle and entry control points with veterans of Operation Iraqi Freedom I and II, Kilo Company, 3rd Battalion, 4th Marine Regiment. “It’s important to us to try and pass on the things we learned while over there,” said Cpl. Joshua Lipe, squad leader, Kilo Company, 3rd Bn, 4th Marine Regiment. “We’re teaching them things that we didn’t know before we went, so they can be as prepared for what they will face as possible,” added the Carbondale. Ill. native. Watching the Marines from Thundering Third with a little extra pride was a 3/3 squad leader, who previously served as a School of Infantry instructor. Many of the Marines from 3/4 were his former students, and they were now training him and his Marines. “I knew I’d get my chance,” said Sgt. Charles Bennett, a squad leader with 2nd platoon, Kilo Company, 3rd Battalion, 3rd Marines who was serving at SOI during the attacks of September 11. “It makes me feel proud. I’m glad I could do them that service so now they can teach me something. This shows what a brotherhood we are as Marines,” continued Bennett. The Kilo Company squad leader said his former pupils now had a confidence and fire he hadn’t seen in them before, and that the words and advice on tactics and techniques they passed, couldn’t have come at a better time. “This training is bringing it all together for us to go out on our deployment and get the job done right,” finished Bennett. Other Marines have wholeheartedly agreed. And while the days are long and only look to get longer during the pre-deployment package, everyone in America’s Battalion knows that what they learn here will ultimately improve their skills once it’s time to deploy. From the point men in the fire team, to the highest echelons of command, The Marines of Third Battalion, 3rd Marine Regiment, “America’s Battalion,” are gritty, determined and ready to roll. CAMP ELLIOTT, SAN DIEGO, Calif. — The Marines are alert and edgy, their lumbering 7-ton truck bristling with weapons as it winds its way through the dusty convoy course at Camp Elliott. The path is clear for now. Suddenly, the whole sky seems to burn, and the road is obscured in a cloud of dust, debris and the acrid smell of burning sulfur. They’ve been hit. As 3rd Battalion, Third Marine Regiment continues its high-speed training with special effects support from Segall Studios in San Diego; they are getting a taste of the convoy operations and Security and Support Operations (or “Small Wars”) missions. These are the possible missions they will soon undertake as part of a contingency deployment. The mock Afghan town the Marines are operating in and around, is the brainchild of Segall Studio’s production design team and Ken Kirven, construction coordinator. Ringed by contradictions like aircraft doing touch and go’s at Marine Corps Air Station Miramar and the occasional civilian on horseback, the “town” in question nevertheless looks, smells and feels like a remote village in the Afghan hills. “We specialize in realism,” said Kirven, “gesturing to the adobe walls, brightly painted with Pashtun and Arabic phrases and signs, and the marketplace filled with bags of grain and trinkets for sale. No detail is overlooked to provide Marines training here with an experience as close to being there as possible. Kirven, who is dedicated to making a difference with his construction, was working late into the evening to complete the entire village before the field exercise began. Miraculously, the entire multiple street village was put up by a handful of his men in less than a week. And the Marines of America’s Battalion are bent not only on staying alive, but accomplishing the mission at hand. Through the different scenarios, each platoon took different tactical approaches to entering and securing the village and keeping the peace once they were there. “We’re watching the Marines to see how they interact with the heads of households as well as their individual tactics, techniques and procedures for dealing with the scenarios we throw at them,” said Stewart Brown, observer and controller for 3/3’s training here. “This is not a pass/fail exercise. This is just another stop along their training and hopefully they can pick up some extra tools,” Brown continued. According to the “3-block” theory of war fighting, Marines must be ready and capable of handling humanitarian assistance on one block of a city, peacekeeping on the next, and full-on urban fighting on the third. The Marines of 3/3 don’t plan on letting that happen. Instead, they are becoming increasingly confident they know how to properly proportion their use of force for any and all manner of situations they may face. America’s Battalion is ready for anything.